French President Emmanuel Macron has vowed to rebuild Notre-Dame Cathedral. Macron expressed relief saying the worst had been avoided. 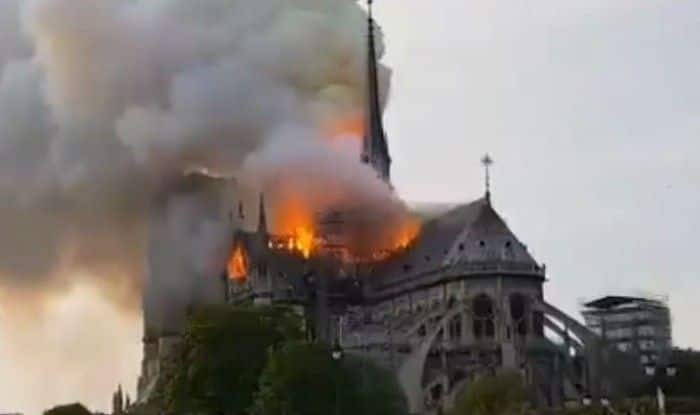 Paris: The raging blaze that destroyed the roof and the spire of the 850-year-old UNESCO world heritage landmark of Notre Dame Cathedral in France has been brought under control. It took nearly 400 firefighters to control the inferno until the early hours of Tuesday. “The fire is completely under control. It is partially extinguished, there are residual fires to put out,” reported AFP news agency. Paris fire brigade chief Jean-Claude Gallet said that the main structure of Notre-Dame had been saved and preserved as well as the two towers. Though the cause of the fire is not known yet, officials said it could be because of the renovation work that began after cracks appeared in the stone. Meanwhile, French President Emmanuel Macron has vowed to rebuild Notre-Dame Cathedral. Macron expressed relief saying the worst had been avoided. “We will rebuild Notre-Dame because it is what the French expect,” said Macron. French billionaire François-Henri Pinault said he will donate 100 million euros to help reconstruct the Notre Dame Cathedral. Since the news broke out, several leaders have expressed their anguish at the huge loss. The Vatican expressed shock and sadness and said that it was praying for the French fire services. Calling Notre-Dame a symbol of French and European culture, German Chancellor Angela Merkel offered her support to the people of France. UK Prime Minister Theresa May said in a tweet, “My thoughts are with the people of France tonight and with the emergency services who are fighting the terrible blaze at Notre-Dame cathedral”. US President Donald Trump took to Twitter and said it was horrible to watch the fire and suggested that flying water tankers could be used to extinguish the blaze. Located in the heart of the French capital in the Middle Ages, Notre Dame’s construction was completed in the mid-12th century after 200 years of work. During the French Revolution in the 18th century, the cathedral had been vandalised.